we have been Teaching students since 2005, and we believe in a professional, but relaxed learning environment. We are based in Solihull, West Midlands: Around 10 miles from Birmingham and 110 miles for London. We have been in the Japanese food business in the UK for 30 years. We have been training chiefs all over the EU and helping them start restaurants for 10 years. We have now taught over 1500 students, both domestic and professional, since we started our private classes in 2005, in London. You can expect to learn traditional and authentic ways of making sushi, as well as knowledge to you may need to make your own outside our classes. The what and the why of a Private lesson. We pride ourselves in only delivering smaller private lessons, rather than lessons in large groups. You, and up to 3 others, have the undivided attention of 2 teachers, so you can gain the confidence to start making at home. The course is held in our home in Solihull, in a spacious and clean kitchen. We can tailor the course to suit your needs and wants. Have that one topping you just can't resist? Or maybe you have one you just can't handle. We will do our best to accommodate you. We also sell gift vouchers, which can be sent out inside a Japanese card like the ones below. The experience isn't over when the class finishes. You will take the sushi you make on the day with you when the class finishes. Each student will take home a big sushi tray that will feed 3 people. Don't forget to arrange a sushi party with your friends and family, as the sushi needs to be eaten on that day! No need for a pen and paper. We'll send you a how-to in PDF format after the lesson, so that you can refresh your memory at any time. There's more to it than just making. We will tell you how to source the right ingredients for your sushi making journey, including rice and fish, as well as context behind the food and how to eat sushi the traditional way. 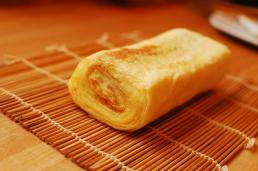 We will also show you how to make sushi omelette. Right in front of you, on the day. A picture taken by one of our students.